The Stableford format is a popular format as it allows an individual golfer to play the course on his/her own merits but, in the event of a bad hole, allows the golfer to pick up the ball and move onto the next hole. This can help to speed up the round and reduce frustration in a golfer who is not playing very well. Stableford is a competition which can be played as an individual competition, a team competition or a combination of both. Golfers are allocated a certain number of points on a hole depending on the net score of the player (or team). The aim of Stableford is to accumulate the most number of points over the course of 18 holes. Depending on a players handicap a certain number of strokes are allocated on each hole. If a golfer plays off a 22 handicap then they will receive 22 shots during the course of the round - 1 on each of the 18 holes and 2 strokes on those holes which are rated in difficulty of 1, 2, 3 and 4. If a golfer plays off a 14 handicap then they will receive 14 shots during the course of the round - 1 on each of the 14 hardest holes. No strokes will be received on the holes rated 15, 16, 17 and 18 in difficulty. In this case a par 4 hole which is rated number 11 in difficulty will ensure the golfer receives 1 shot thus making the hole effectively a par 5. So if this golfer then scores a 5 on the hole this equates to a net par thus scoring the person 2 points (refer above table). A format where good play is rewarded. Generally is only used where the standard of golfers in the field is intermediate or higher. Used on occasion for Corporate Golf Days. Are you organising a golf day? 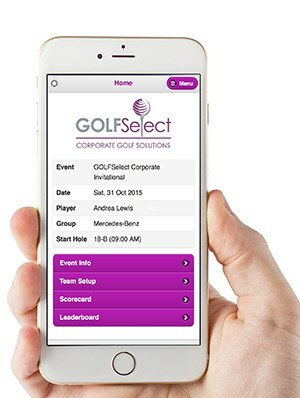 Why not use use the GolfDayPro Mobile Scoring and Live Leaderboard system? The GolfDayPro Mobile Scoring and Live Leaderboard system works across all mobile devices without the need to download or purchase apps. Players enter their scores as they make their way around the course and can view the live leaderboard. Players can also view hole playing tips, competition holes, and sponsor information as they play each hole. To keep the suspense of the day intact, the leaderboard is turned off after 14 holes thus preserving the final result until the prize presentations. 2019 Presidents Cup | Melbourne | Dec 9-15, 2019 | Book now. Melbourne - Presidents Cup 2019 | Dec 9-15, 2019 | Book now. The 2019 Presidents Cup is being held at the world famous Royal Melbourne Golf Club from December 9-15, 2019. The world's best golfers will descend on Royal Melbourne and now is your chance to experience the excitement of this tournament and play the best golf courses in Melbourne and the rest of Australia whilst you are here. GOLFSelect is a licensed travel operator for the 2019 Presidents Cup PC19AUNZ-1070 and can also arrange access to the top private golf courses whilst you are in town. GOLFSelect is Australia's leading corporate golf and golf holiday organiser, offering unrivalled access to the world's best golf courses. Gary Lisbon is one of the world's leading golf course photographers.